We’ll provide some insights and review some of our DFS value players for week 7. 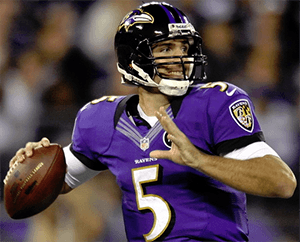 Joe Flacco (BAL) – Salaries: DraftKings (DK) – 5400, FanDuel (FD) – 7500. Flacco’s upcoming salary ranks him 17th/13th on DK/FD, respectively for the position. Flacco posted a 25/37, 238, 1:1 line and 3-4-0 on the ground at Tennessee last week. Flacco’s fantasy points of 12.92 ranked him 22nd on both DK/FD. The betting lines with the Saints list the game total at 49.5 points with the Ravens as -2.5 point home favorites. The Ravens’ implied team total is currently at 26 points and the Saints are currently at 23.5 points. The Saints rank 30th against QBs in fantasy points allowed and last against WRs. The Saints’ defense also ranks 30th in DVOA against the pass, 30th in pass yards allowed with 297.6/gm, and 26th in points allowed with 28/gm. The Ravens rank 9th in pass yards per game and 12th in points per game with 293.8 and 25.5, respectively. Alex Smith put up a 23/39, 275, 0:1 line and 2-7-1 at New Orleans in week 5. New Orleans is coming off their bye. Flacco ranks 2nd in pass attempts with 264 and the Ravens’ offense ranks 1st in plays/gm with 75.8. The Saints give up the 2nd most fantasy points per attempt at .61. The Saints’ defense ranks 1st in rush yards allowed per game with 71.4 and 5th in fantasy points allowed to RBs, so it shouldn’t be a surprise to see Flacco slinging it all over the place in one of the top QB friendly matchups. Mitch Trubisky (CHI) – Salaries: DraftKings (DK) – 5600, FanDuel (FD) – 7500. Trubisky’s upcoming salary ranks him 15th/13th on DK/FD, respectively for the position. Trubisky posted a 22/31, 316, 3:1 line and 8-47-0 on the ground at Miami last week. Trubisky’s fantasy points of 31.34/28.34 ranked him 4th/5th on DK/FD, respectively for the position. Trubisky’s price per point efficiency ranked him 4th on both DK/FD. The betting lines with the Patriots lists the game total at 49.5 points with the Bears as +3 point home dogs. The Bears’ implied team total is currently at 23.25 points and the Patriots are currently at 26.25 points. The Patriots’ defense ranks 23rd against QBs in fantasy points allowed and 19th in DVOA against the pass. The Patriots also rank 21st in pass yards allowed per game with 268.7 and 18th (tied) in points allowed with 24.7/gm. The Patriots’ defense ranks last (tied) in sacks with 7. Pat Mahomes put up a 23/36, 352, 4:2 line and 2-9-0 on the ground at New England last week. Trubisky ranks 10th for QBs in fantasy points scored and 5th in rush yards for QBs with 32.8/gm. If the negative game script holds for Chicago, Trubisky should have to shoulder the load to keep pace with New England’s offense. Peyton Barber (TB) – Salaries: DraftKings (DK) – 3800, FanDuel (FD) – 6100. Barber’s upcoming salary ranks him 51st/29th on DK/FD, respectively, making him a better relative value on DK. Barber posted a 13-82-0 rush line and 4-24-1 on 4 targets at Atlanta last week. Barber’s fantasy points of 20.6/18.6 ranked him 10th/9th on DK/FD, respectively for the position. Barber’s price per point efficiency ranked him 1st/7th on DK/FD, respectively. The betting lines with the Browns list the game total at 50 points with the Bucs as -3 point home favorites. The Bucs’ implied team total is currently at 26.5 points and the Browns are currently at 23.5 points. The Browns rank 26th against RBs in fantasy points allowed and 24th in DVOA against the run. The Browns’ defense also ranks 29th in rushing yards allowed with 138.2/gm. The Chargers’ RBs combined for a 25-192-3 line and 2-18-0 on 4 targets at Cleveland last week. Barber dominated snap share for Tampa RBs at 62%. Ronald Jones was 2nd with 18%. Barber also out-touched Jones 17 to 4. Perhaps this committee-back quagmire has come to an end. Tampa Bay’s 2nd worst run-game is bad, but at least they have now shown a pulse, and it looks like Barber is the guy. The matchup is solid and Barber’s price is dirt cheap. Tarik Cohen (CHI) – Salaries: DraftKings (DK) – 5100, FanDuel (FD) – 6600. Cohen’s upcoming salary ranks him 21st/16th on DK/FD, respectively. Cohen posted a 5-31-1 line and 7-90-0 on 9 targets at Miami last week. Cohen’s targets and catches were team highs. Cohen posted a 13-82-0 rush line and 4-24-1 on 4 targets at Atlanta last week. Cohen’s fantasy points of 24.1/19.6 ranked him 8thon both DK/FD for the position. Cohen’s price per point efficiency ranked him 4th/6th on DK/FD, respectively. The Patriots rank 18th against RBs in fantasy points allowed, 13th in DVOA against the run, 16th in DVOA against RBs in the pass, and 18th in rushing yards allowed with 110.7/gm. The Chiefs’ RBs combined for a 13-90-0 line and 7-114-1 on 9 targets at New England last week. Cohen and Jordan Howard had a near even snap and touch count, but if the negative game-script holds for Chicago, especially early, Cohen’s role should only increase. His speed could prove problematic as that is something New England’s defense lacks. Cole Beasley (DAL) – Salaries: DraftKings (DK) – 3900, FanDuel (FD) – 6200. Beasley’s upcoming salary ranks him 60th/36th on DK/FD, respectively for the position, making him a much better relative value on DK. Beasley posted a 9-101-2 line on 11 targets (all team highs) against Jacksonville last week. Beasley’s fantasy points of 34.1/26.6 ranked him 4th/5th on DK/FD, respectively for the position. Beasley’s price per point efficiency ranked him 1st/3rd on DK/FD, respectively. The betting lines with the Redskins lists the game total at 41.5 points with the Cowboys as +1.5 point road dogs. The Cowboys’ implied team total is currently at 20 points and the Redskins are currently at 21.5 points. Washington’s defense ranks 19th against WRs in fantasy points allowed and 13th in DVOA against the pass. Carolina WRs combined for a 15-179-2 line on 21 targets at Washington last week. Perhaps the Cowboys have a found a solution to their anemic offense outside of Ezekiel Elliott. Perhaps it’s as simple as running Dak Prescott a lot more and targeting your best WR. Despite last week being the only week this season Beasley had seen double-digit targets, he leads the team in all receiving categories. It would be hard to trust Scott Linehan to figure this out, but in the off chance this happens, Beasley could be a solid, cheap option. Willie Snead (BAL) – Salaries: DraftKings (DK) – 4000, FanDuel (FD) – 5400. Snead’s upcoming salary ranks him 58th/56th on DK/FD, respectively for the position. Snead posted a 7-60-0 line on 10 targets at Tennessee last week. His targets, catches, and 72% snap rate were all team highs for WRs. As covered previously under Joe Flacco above, the Saints pass defense makes for a weekly target. Michael Crabtree should see CB Marshon Lattimore the most. Snead provides the cheapest Baltimore receiving option with a great matchup. Keke Coutee (HOU) – Salaries: DraftKings (DK) – 4300, FanDuel (FD) – 5600. Coutee’s upcoming salary ranks him 49th/48th on DK/FD, respectively for the position. Coutee posted a 3-33-0 line on 5 targets against the Bills last week. The betting lines with the Jaguars list the game total at 42.5 points with the Texans as +5 point home favorites. The Texans’ implied team total is currently at 18.75 points and the Jaguars are currently at 23.75 points. The Jaguars’ defense ranks 1st against WRs in fantasy points allowed, 7th in DVOA against the pass, and 1st in passing yards allowed per game with 187.8. Overall, this is a tough matchup for the Texans. Deandre Hopkins should see a lot of Jalen Ramsey and Will Fuller should face a lot of A.J. Bouye. Deshaun Watson will always take his shots with Nuk, but Coutee gets the best matchup and the path of least resistance in the slot, where Cole Beasley lit them up last week. If Fuller is used in the lid-lifter role, he can create space for Coutee, and Watson would be wise to target the lowest hanging fruit available to him. If Coutee doesn’t end up as the 2nd highest targeted player in this game (as he was last week), then there’s something seriously amiss with this offense. TE Ryan Griffin (illness) has been ruled out for week 7. Coutee’s target share should get a slight uptick. Griffin got 5 targets last week. O.J. Howard (TB) – Salaries: DraftKings (DK) – 3600, FanDuel (FD) – 5800. Howard’s upcoming salary ranks him 14th/11th on DK/FD, respectively for the position. Howard posted a 4-62-1 line on 4 targets at Atlanta last week. Howard’s fantasy points of 16.2/14.2 ranked him 6th/4th on DK/FD, respectively, for the position. Howard’s price per point efficiency ranked him 5th/6th on DK/FD, respectively. The Bucs’ defense ranks 14th against TEs in fantasy points allowed and 3rd in DVOA against TEs. The Browns’ defense also ranks 20th in both pass yards allowed with 268.3/gm and points allowed with 25.2/gm. Howard led all Tampa Bay TEs in snap rate with 52%, and out-targeted and out-touched the other Tampa TEs combined last week. Howard makes for a cheap, viable play this week. 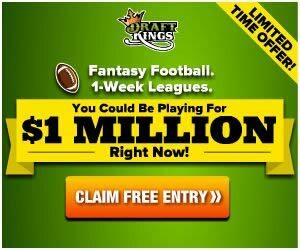 David Njoku (CLE) – Salaries: DraftKings (DK) – 4200, FanDuel (FD) – 5700. Njoku’s upcoming salary ranks him 11th/12th on DK/FD, respectively for the position. Njoku posted a 7-55-1 line on 12 targets against the Chargers last week. Njoku’s fantasy points of 18.5/15 ranked him 2nd on both DK/FD for the position. Njoku’s price per point efficiency ranked him 4th/5th on DK/FD, respectively. The Bucs’ defense ranks last against TEs in fantasy points allowed and 29th in DVOA against TEs. The Bucs’ defense also ranks last in both pass yards allowed with 355.6/gm and points allowed with 34.6/gm. In Baker Mayfield’s three starts this season, Njoku has totaled an 18-176-1 line on 30 targets. Njoku ranks 2nd on the team in all receiving categories, only behind Jarvis Landry. Njoku is seeing a lot of targets and the matchup doesn’t get any better. Austin Hooper (ATL) – Salaries: DraftKings (DK) – 4200, FanDuel (FD) – 5900. Hooper’s upcoming salary ranks him 11th/9th on DK/FD, respectively for the position. Hooper posted a 9-71-1 line on 10 targets against Tampa Bay last week. Hooper’s fantasy points of 22.1/17.6 ranked him 1st on both DK/FD for the position. Hooper’s price per point efficiency ranked him 1st/3rd on DK/FD, respectively. The betting lines with the Giants list the game total at 54.5 points with the Falcons as -5.5 point home favorites on Monday night. The Falcons’ implied team total is currently at 30 points and the Giants are currently at 24.5 points. The Giants’ defense ranks 11th against TEs in fantasy points allowed and 11th in DVOA against TEs. The Giants’ defense also ranks 10th in pass yards allowed with 236.3/gm, 24th in points allowed with 27/gm, and 27th in DVOA against the pass. Philadelphia TEs posted a combined 8-50-1 line on 10 targets at New York last week. Hooper has logged 22 targets, 18 catches, 148 yards, and a TD over the past two weeks. If it ain’t broke…don’t fix it.